Hi here is Amélie. Today, a new Simple Strategie challenge. 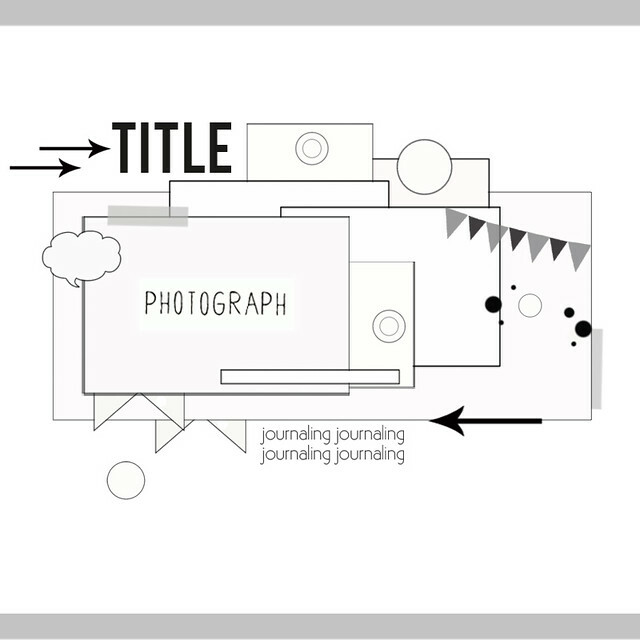 I will explain you how to make this layout. A very simple layout with an original design! For this layout, you need these supplies from Main and Embellie kits. To begin, I stuck my Pink Paislee paper on grey paper and used the twine of the package to make a hanging like this. After I created my picture frames. I stuck my picture and fabric ribbon with washi tape. Now, it's up to you! Have a good scrappy day! Hi everyone, it's Gina here, sharing our final sketch for the month and its another fun one..
..and here's my take on it, using just the Wander kit add-on. I love the soft and summery colours in this kit, I used a photo of my youngest daughter Jem that has the same subtle tones.. I've altered some white cotton off-cuts with a little mist to match the alpha stickers.. 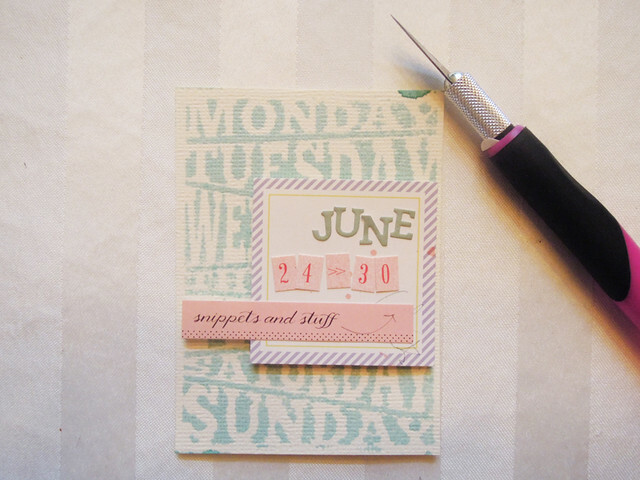 ..I've hand written my journaling onto some left over CTK Pocket Life printable labels, these were from June.. I've also changed up the banner a bit by adding a label to it..
To play along with our sketch challenge, upload your layout to the gallery by 6th October to get your name in a drawing to win a $5 GC to the store. 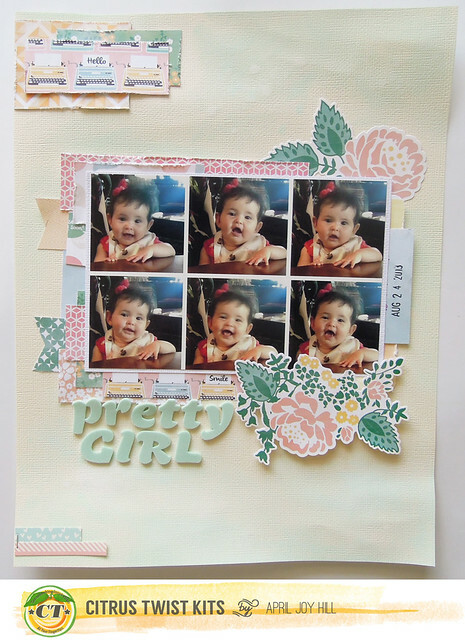 When uploading to the gallery, you can name it as you would normally, but please include "sketch 10/6"
Hi it's Sandy with my favourite layout created using this month's Main kit, Pattern Paper Add-On kit and Embellie Kit. The only thing not from the kits is the background cardstock. This is one of the rare occasions when I didn't plan or sketch out my design, instead I just gather all the grey papers and start layering beneath the photo. 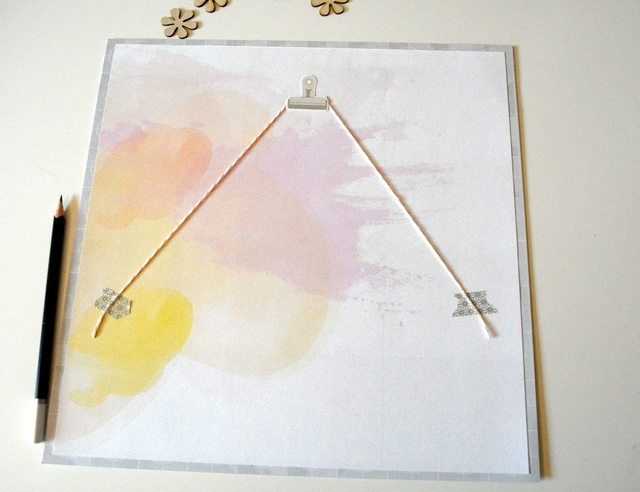 Then I use pops of soft colour to create a series of visual triangles around the framed rectangle of the photo. There's a pale blue triangle that leads the eye from the title (The Best) down to the subtitle (You're #1). Another less obvious triangle is formed by repeating the heart-shaped motif. By placing a fussy cut brown heart right under the chocolate frame, I extend it's boxy shape into an upside down triangle, an illusion helped along by the diagonal line of my cousin's elbow in the framed photo. A more obvious design element is the use of lines that converge on the photo. 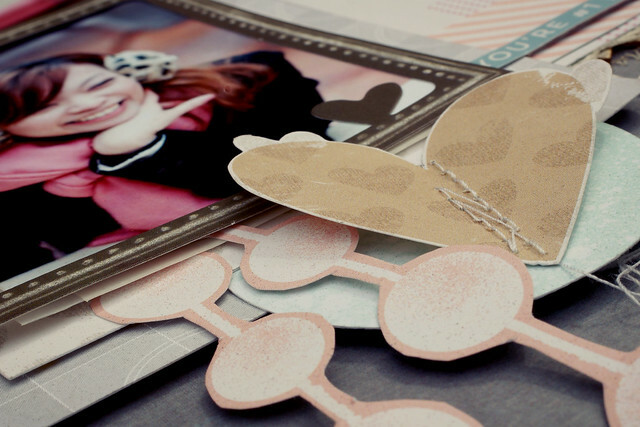 I start with these fussy-cut polka dot garlands radiating out vertically from the framed photo. Then I add zig-zag machine stitching along the horizontal axis. A length of Prima mesh trim (using the reverse side as gold on the front is too glittery against this matt colour palette) reinforce this line and lend a bit more texture to the page. 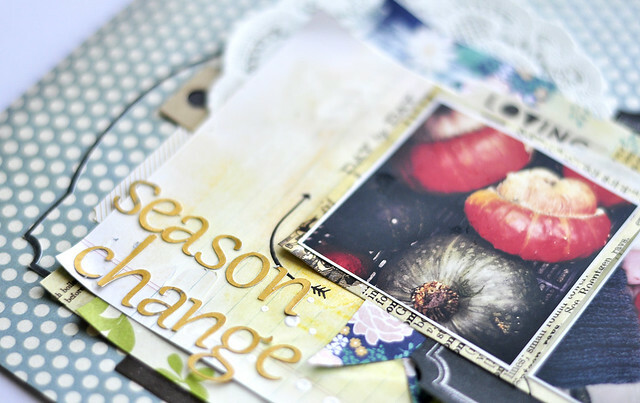 I hope you are enjoying working with your September kits and look forward to seeing your pages in our Gallery. Hello, and a happy Friday to all of our Citrus Twist fans! 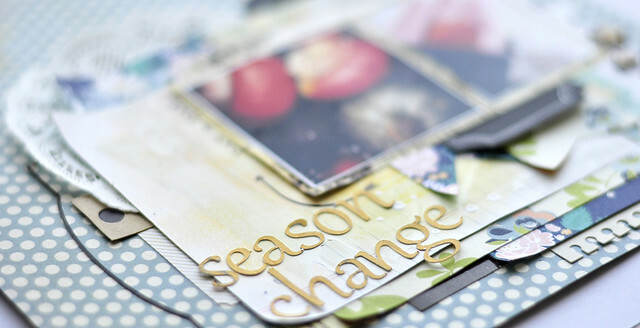 This is Melissa with you today to share a weekly dose of Pocket Life scrapbooking with you. 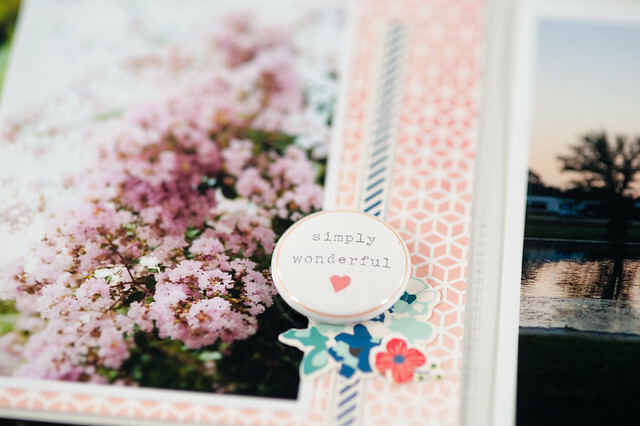 I recently sat down and got caught up on the photo printing portion of my weekly scrapbooking, and it's awesome to have some more recent photos to work with now. 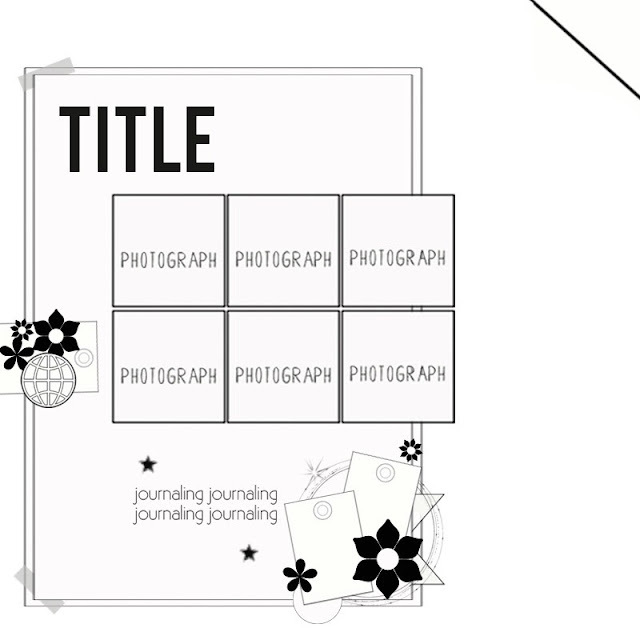 I don't worry about staying caught up on the actual scrapbooking portion of my album, but I do like to stay relatively current on having photos printed so I have lots to choose from when it's time to sit down and make a layout. These particular photos are from July and cover a week where my husband left for a trip out of the country, I was at home working, and on the weekend I visited my family for my niece's third birthday party. Quite a diverse set of activities in a seven day period! 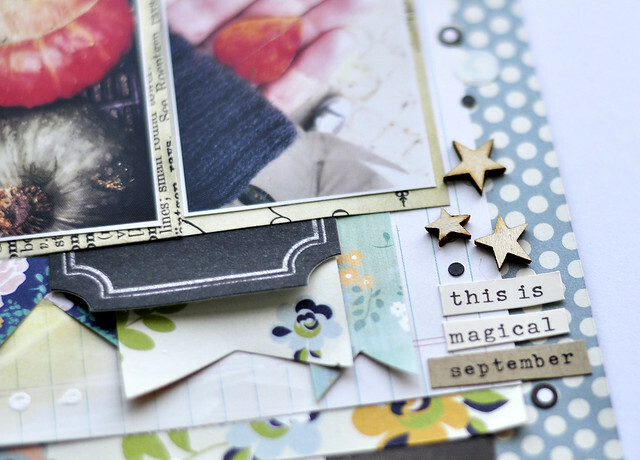 Stars are a recurring theme in several of the kits this month, and, since I love to mix all of my kits together while scrapping, lots of them showed up here! I used the wood card with the star cutouts to frame up my title card, and the stars on the "Rating" card from the Hello Again cutout sheet (in the patterned paper add-on) simply begged to be filled in with some little enamel dots from the main kit. I'm trying something new with my Pocket Life sketches this month and have drawn them up on the computer! All of the Pocket Life girls at Citrus Twist have their own style of presenting sketches, so you won't see them in this format every week, but I'll be doing them this way in my posts from now on. And if you'd like to download them in PDF format, you can do that here. 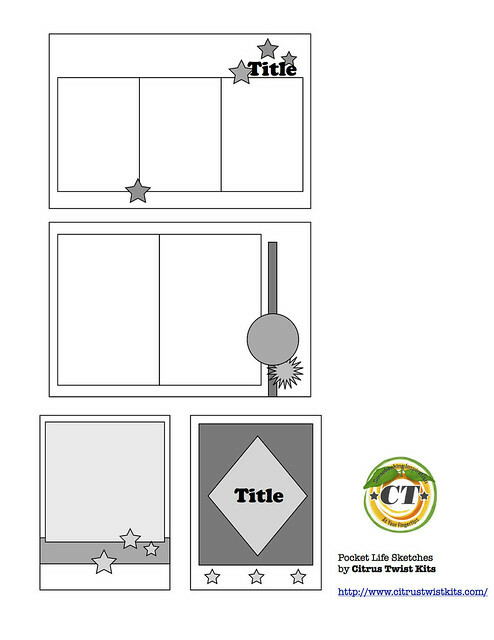 Speaking of Pocket Life sketches, you may have noticed the sketch sheets being included with your monthly Pocket Life kits now! Kasia has taken her gift of making lovely sketches and applied it to Pocket Life, and you'll be seeing these in your kits from now on. It's just one of the little ways that Citrus Twist likes to thank our subscribers- we truly appreciate each and every one of you! 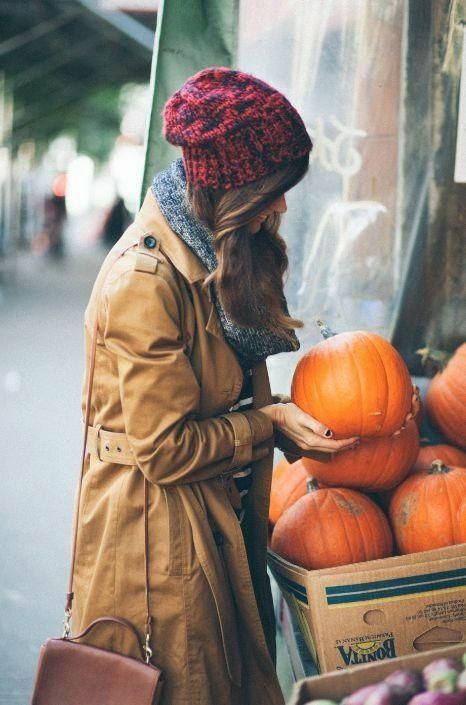 Hello everyone and welcome on Thursday! 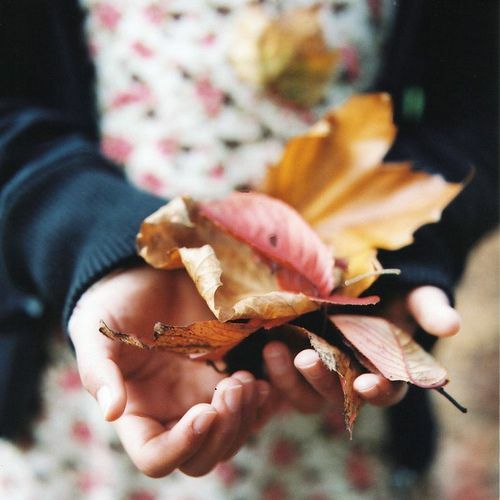 It's Kasia here today with a handful of inspiring photos from my favourite time of the year- transition between summer and fall! 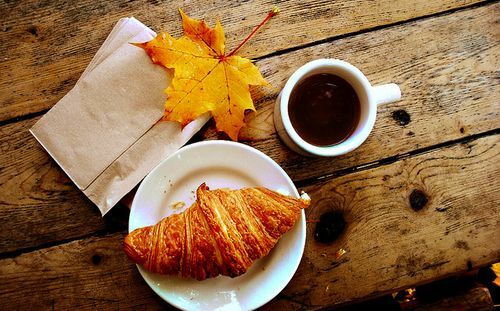 I love the days when the weather gets cooler, evenings are longer and mornings tempt to stay in bed with a cup of delicious coffee. 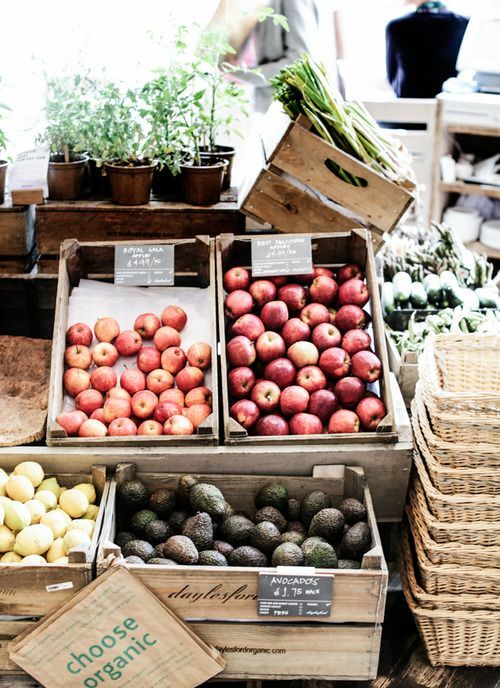 I find this time the most creative and inspiring with beautiful colours and textures everywhere. 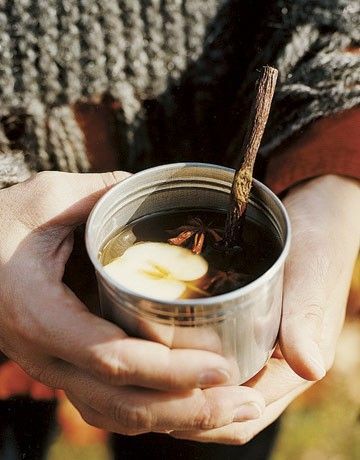 I hope these few images will help you to fell autumn mood! 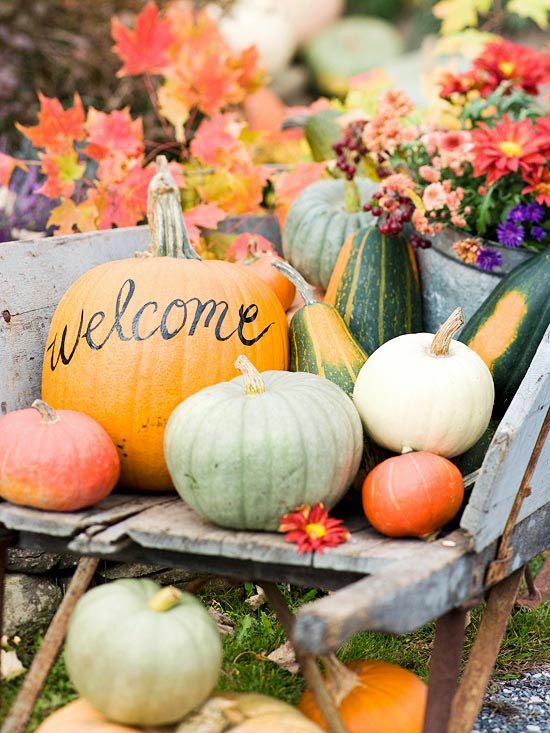 I also couldn't resist to create fall inspired layout. Although the kits which I've been working with this month- “Magical” main kit, “Big Deal” embellie kit, “She Said” patterned paper kit and “Favorite” Pocket life kit aren't filled with autumn themed products I managed to create below layout with them and a little help of the medias from my cupboard. 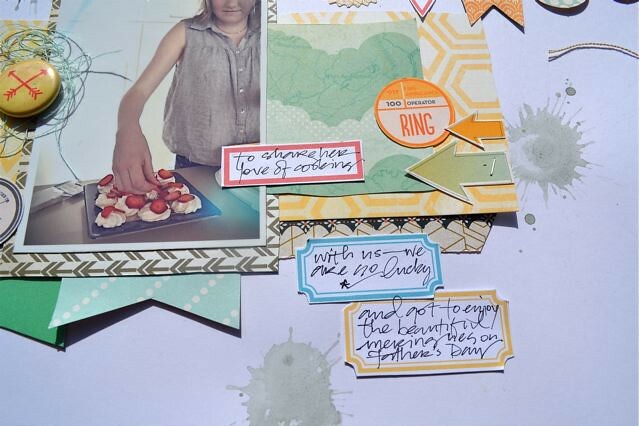 The polka dot paper made a great background and mixed layers of floral and notebook papers created fun layers. I cut the title with my cameo and added some cut pieces of stickers here and there. 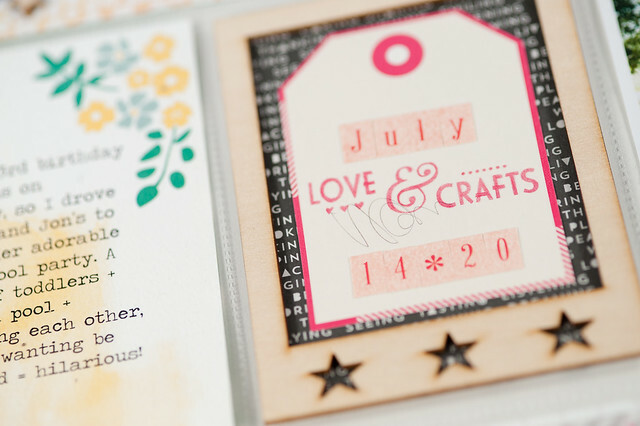 I love this month's stamps and the gorgeous, a little uneven exclusive wood veneer stars! 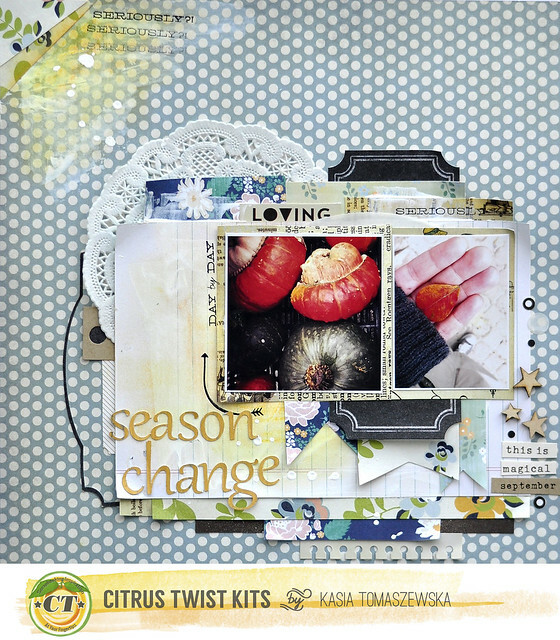 I can't wait to see your autumn layouts popping up in our Citrus Twist Kits gallery! Have a lovely Thursday! 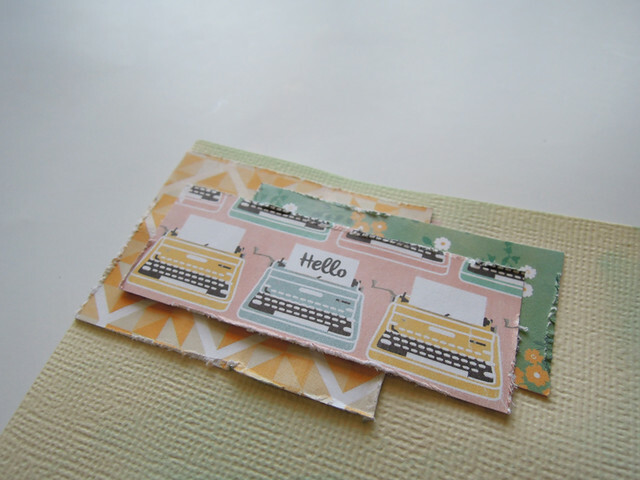 By now, you know that the Hello Again by Kaitlyn Shaefer 6x6 paper pad is what comes in the Sept PL kit. 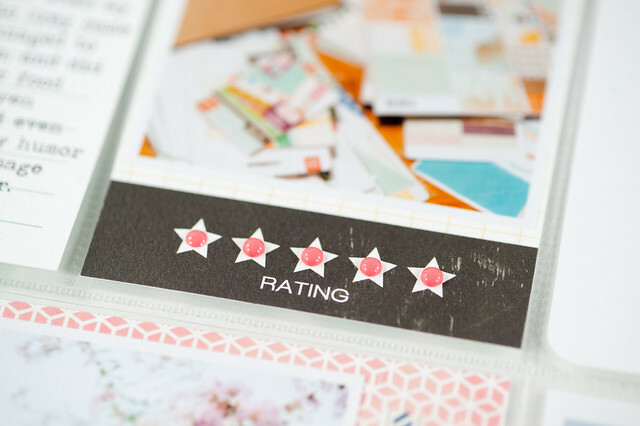 I absolutely LOVED this paper pad and HAD to use every little bit of scraps I had leftover, so I created this layout so I could use the scraps as layers! By a super strange coincidence, I had created this layout without knowing what Kasia's sketch for the Sunday sketch challenge would be. When I saw Nina's post on Sunday, I was pretty shocked by how similar my layout was to her sketch! Haha! I had taken a bunch of pictures of my friend's daughter while we were at lunch one day and I knew I wanted to incorporate as many of those pictures as I could, so I created a collage using the PicFrame app on my iPhone. The flower sticker was a big sticker from the Hello Again sticker sheet. I decided to fussy cut it in half and use it on opposite sides of the picture since it was so big. 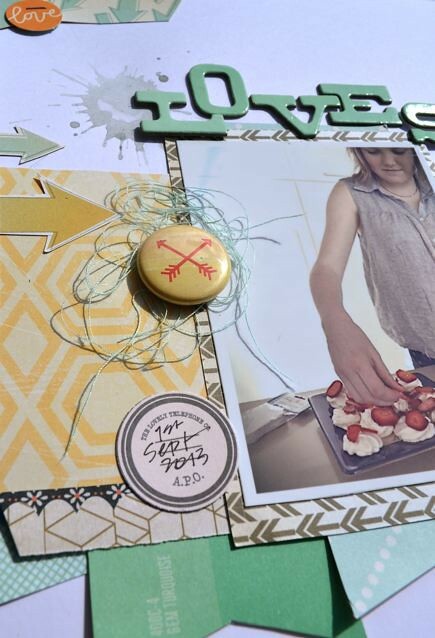 I like using foam dots to raise embellishments off a page. I hid my journaling under the picture. Sometimes I find several photos that support the story I want to tell but when it comes to arranging them together on the page I hit a snag. The photos, perhaps taken at different locations or taken years apart, have colours that are just too contrasting. 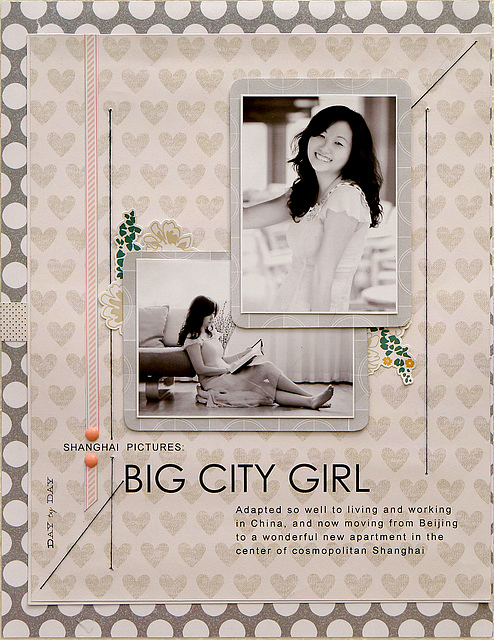 In this situation I find converting the photos to black and white allows me to design a more harmonious layout. In this tutorial I'll show you how to do this without having to install any fancy photo-editing software. 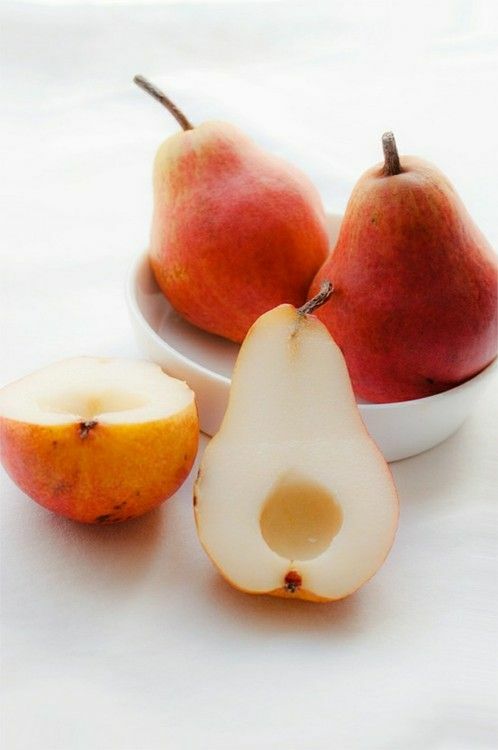 Go to iPiccy.com. It's a free site that doesn't require any software download. Scroll down the left menu bar, click on the "Color - Black & White" option and on "Apply"
Click on the "Photo Effects" star wand tab on the top. Scroll down the left menu bar and click on the "Daguerreotype" option. Click on the "Save" diskette tab on the top and save your edited photo. 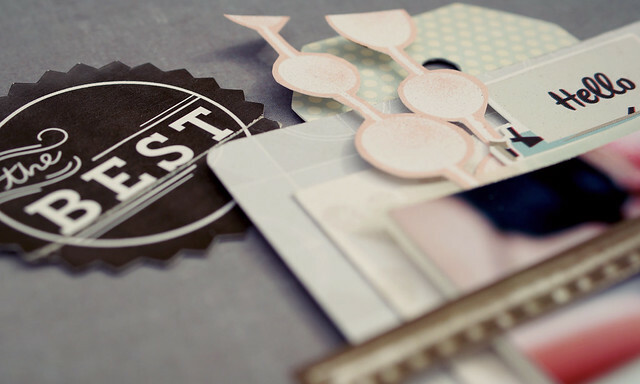 I hope you find this photo editing tip useful for scrapping those multi-photo pages. 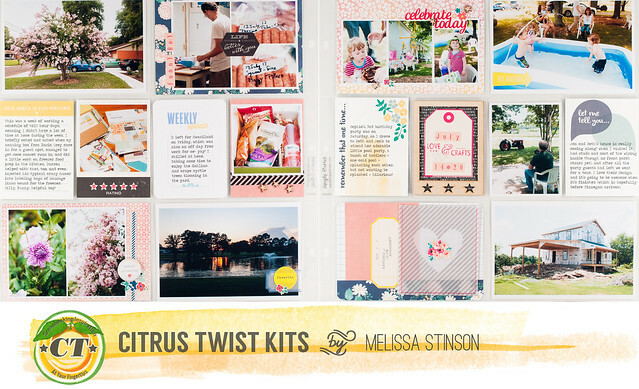 Citrus Twist Kits is teaming with The Crafter's Workshop this month for a blog hop and giveaways. 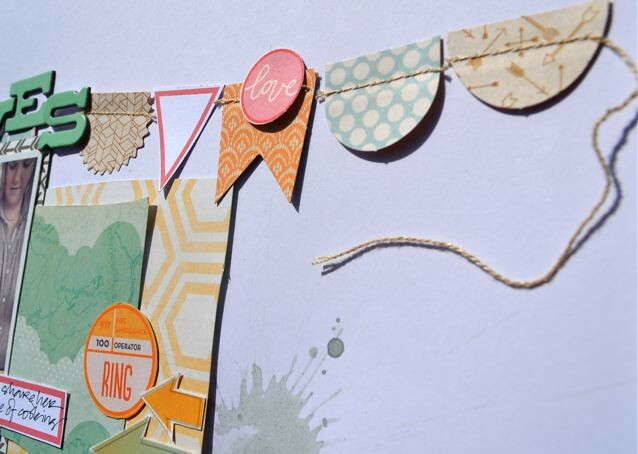 We are celebrating the launch of Citrus Twist Kit's Design Girl, Jen Boumis's, Life Bits stencils. 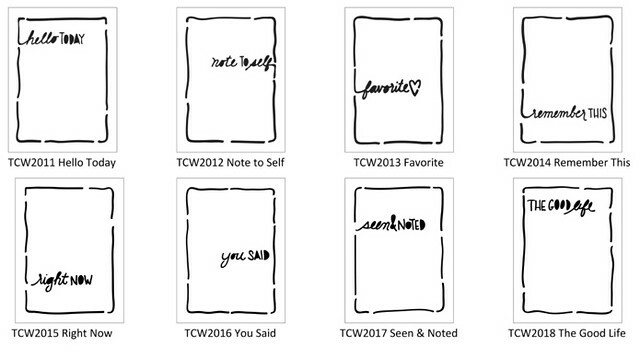 It all started with Jen's wonderful, handwritten style (that you Pocket Lifer's got to enjoy with our exclusively designed PL stamps this summer) teaming with The Crafter's Workshop owner Jaime Echt to create fabulous and fun 3 x 4 stencils for TCW. Here are some of the results of that TCW/Jen Boumis partnership. The blog hop begins today, September 9th, and continues on Mondays and Wednesdays in September through the 23rd. 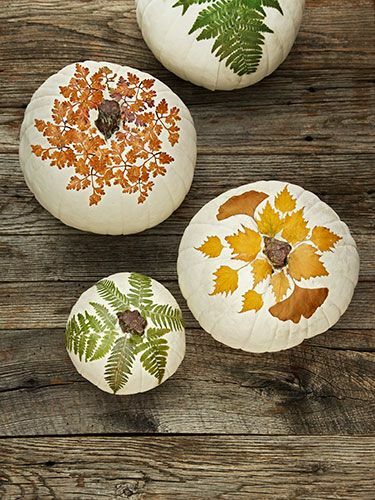 Some of our Pocket Life Design Girls--Jen Boumis, April Joy Hill and WaiSam Ho--are joining with The Crafter's Workshop Design Team members--[Ronda Palazzari and Julie Fei-Fan Balzer]--to share how they are using these wonderful little Life Bits stencils, perfect for life's little projects. Each day of the blog hop--September 9th, September 11th, September 16th, September 18th and 23rd--when you leave a comment or love for the participating designers on their individual blogs and end your hop by leaving a comment here on the Citrus Twist Kits blog you'll be entered into a drawing for a free Life Bits stencil. We'll draw a name from all the people who leave a comment on the Citrus Twist Kits blog each day of the hop and will give away one stencil each day of the hop. 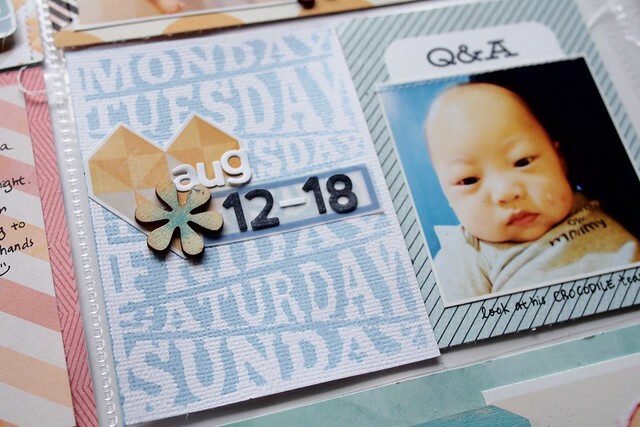 On today's blog hop we are featuring the creative ways the design team members used "Days of The Week". Thank you for stopping by for the hop. Be sure to leave your comments (or some love) below for your chance to win one of the new The Crafter's Workshop Life Bits Days of the Week stencils. Hi, here is Nina here today with a new sketch to share with you. 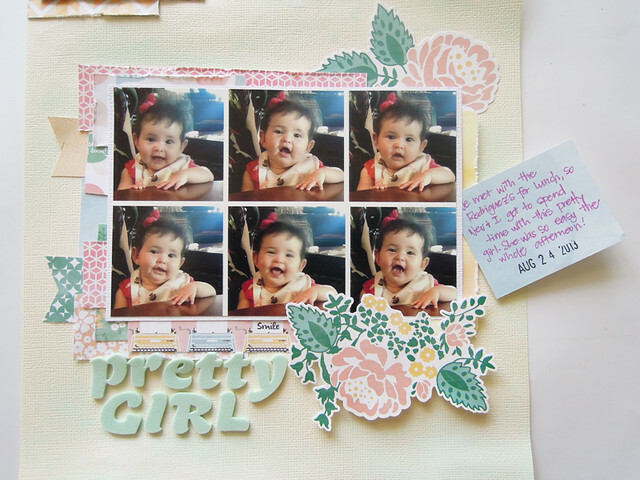 This sketch, designed by design team member Kasia, offering lots of possibilities to use several little square printed photos. 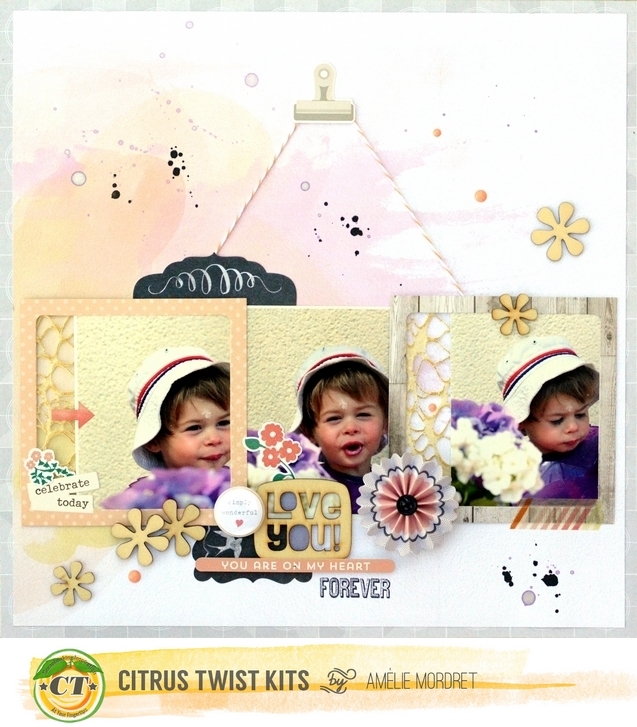 To create this page I used the Citrus Twist September Main Kit "Magical" plus the Embellishment Kit "Big Deal" I printed five square pictures of my son and daughter in a 4x6" and place it on my layering. The square "Dear Lizzy" dimensional sticker fits prefect into the free place of my photo. 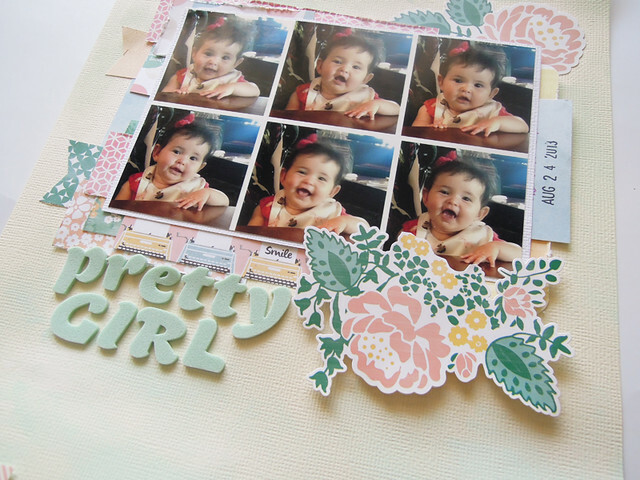 This embellishment comes out the picture with a cute "mommy love message". To finish the page I placed some more details like ink splashes, stickers as well as the super cute fabric feather in pink, orange and gold tones. BTW one of my favorite piece in the September Kit. To play along with our sketch challenge, upload your layouts to the gallery by Saturday, September 28th to get your name in a drawing to win a $5 GC to the store. When uploading to the gallery you can name it as you would normally but please include "Sketch 9/22". I had a lot of fun with this sketch and with the kits this month! I hope you will enjoy this sketch as well!